Why Is There A Ruined Death Star In The Star Wars: The Rise Of Skywalker Trailer? One of the most interesting shots from the awesome Star Wars: The Rise of Skywalker trailer was Rey, Finn and Poe looking out at a colossal piece of Death Star wreckage on some desolate ocean planet. Clearly, this is a remnant of one of the two Death Stars we saw in the Original Trilogy, but which is it, where is it and why are the characters there? Could this be a fragment of the first Death Star destroyed by Luke Skywalker in A New Hope? That was taken down while over Yavin 4, a moon in orbit around the gas giant of Yavin. Obviously, the scene in the trailer isn’t taking place on a gas giant planet, so could this be a side of Yavin 4 we haven’t seen before? Well, the always faithful Wookiepedia informs us that that moon’s primarily covered in rainforests, with the closest it gets to ocean being swampy areas. Despite this, eagle-eyed fans have pointed out that the two Death Star designs are subtly different, and the one we see in the trailer seems to match the first Death Star more closely. Given that Yavin has 26 moons, perhaps this could be one of them? The other candidate is of course Endor. That’s the planet above which the second Death Star was blown up, with the station’s shield generator being located on its forest moon. However, Endor is also a gas giant, meaning these scenes cannot take place on the planet itself. Still, once again, Endor has a number of moons and it’s plausible that this wreckage might have crashed into one we haven’t seen before. More importantly, why are the gang there? Well, with the Emperor officially back, perhaps there’s some kind of artefact aboard that’s the key to bringing him down for good? 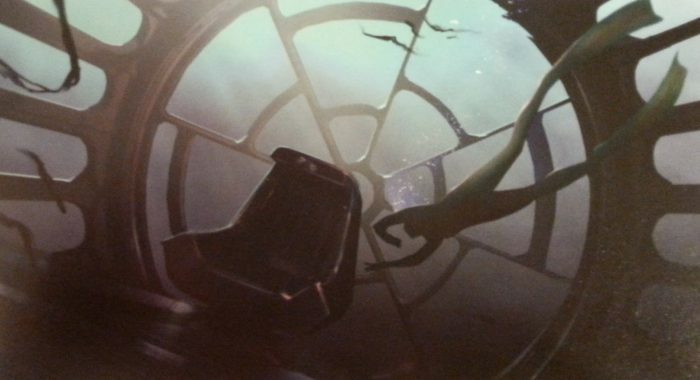 There was a piece of concept art for The Force Awakens that showed Rey diving into the submerged wreckage of the Emperor’s throne room, so maybe J.J. Abrams is resurrecting this idea for Star Wars: The Rise of Skywalker.